For years after Ven. 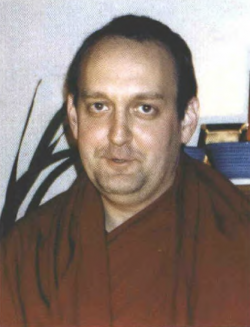 Bob Alcorn became ordained as a monk in 1978, he lived mainly in FPMT centers, availing himself of Dharma teachings and meditation retreats. Then one day Lama Yeshe gave him a gift: a very worn shemtab, a monks’ lower robe, which Lama told him was a “working shemtab.” Ven. Bob soon found himself broke and almost homeless. It was time to get a job.